Mark Brunell started 117 of his 120 games played and completed 2,184 of 3,616 passes for 25,698 yards with 144 touchdowns and 86 interceptions -- all still Jaguars records. 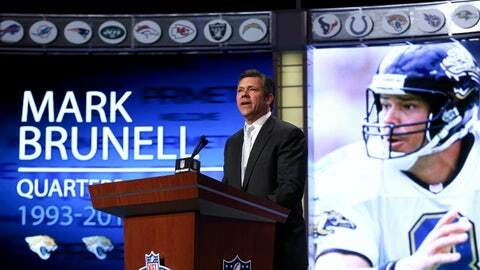 In a statement, Jaguars owner Shad Khan said: "Mark Brunell is a big part of the Jaguars family and the Jacksonville community, and it gives me great pride to join our fans in recognizing Mark and honoring him for his contributions to Jaguars history. And we’re looking forward to welcoming back many of the players who wore the Jaguars uniform in the past. These men helped build this franchise and they helped create a lot of great memories for our fans, so it’ll be a good day of recognizing them as well as honoring Mark."